Private underpasses such as cattle passes are considered only when they can be economically justified by their service and use. Cattle passes are built without bends if possible and so the outlet can be seen from the inlet end. Such structures are, in effect, always paid for by the property owners they serve, or others. Where the right of way is being purchased, the difference in cost between the underpass structure and a structure required to handle the runoff from the drainage area is deducted from the damages to the property. Where others are furnishing the right of way without cost to the department, the property owner or others pay the difference in cost. In all cases when private underpasses are provided, the files include a record of the economic justification. Refer to Maintenance discussion concerning private underpasses for additional information. 646.3.1 Related to Access Control. When a highway project severs a property, access under the structure will be allowed for the landowner. Plan for the improvement is not to be altered to accommodate owner needs unless justified by appraisal. This item is further discussed in EPG 236.6 Appraisal and Appraisal Review. 646.3.2 Types. Bridges, concrete box structures, or large pipes may be used for underpass structures. For cattle passes, a pipe 66 in. in diameter or a box culvert 6 ft. tall may be used. Pipe structures may be specified with paved inverts to increase their utility for use as underpass structures. Vehicular underpasses may be of any reasonable size and are usually box culverts. 646.3.3 Plans. The following note is placed on the plans for each appropriate structure "Access Is allowed under the bridge (or through the culvert)". In addition to the regular note for culverts, the culvert note on plans includes a note "Cattle Pass", "Vehicular Underpass", or "Private Underpass", so the plans will be a record of the agreement with the property owner to construct underpass structures. 646.4 Maintenance. Private underpasses are maintained by the landowner unless otherwise specified in an agreement between MoDOT and the landowner. Only dirt, drift or debris washed in by normal drainage should be removed by maintenance; the property owner must remove all other debris. The approaches must be maintained level. Where approaches are repeatedly washed out they should be repaired with grouted rock or broken concrete. Right of way deeds should be checked to determine limits of maintenance. 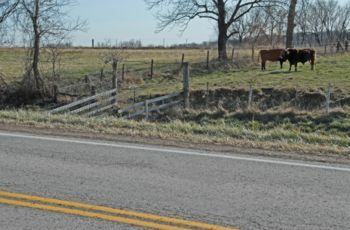 For cattle passes, the fences leading into the structure are to be maintained by the landowner in an acceptable location and manner. Cattle pass structures are to be maintained as constructed and similar to concrete box culverts or pipes. This page was last modified on 8 March 2019, at 11:42.